Theresa May and the Brexit deal are three-time losers after this morning’s vote, and challengers are starting to eye the PM’s job. Placing a really, really long-distance call to Canadian astronaut David Saint-Jacques. People caught on both sides of nightmarish property disputes in B.C. are urging the government to change provincial conservation law. A startling revelation during an interview with hockey broadcast legend Bob Cole. Theresa May is now a three-time loser, by a combined score of 1,167 to 730. 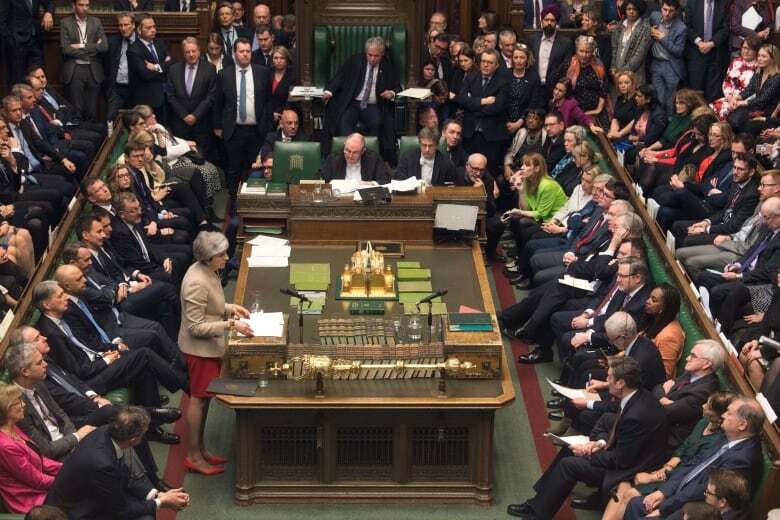 The British Prime Minister’s Brexit deal was again rejected by the House of Commons this morning — although by a closer margin (58 votes) than her humiliating defeats in January and earlier this month. As things now stand, the U.K. has three options: crashing out of the European Union without a divorce agreement on April 12; putting the Brexit issue to voters again via a general election; or trying to negotiate some sort of extension with Brussels in hopes that a compromise solution will materialize. In a post-vote speech, May made it sound like she is choosing door number three. Earlier this week, MPs held eight non-binding “indicative votes” on Brexit scenarios ranging from a no-deal exit, to a new customs union with Europe, to a second referendum, and failed to find a majority for any option. What does seem clear, however, is that May’s time as prime minister is nearly at an end. On Wednesday, she made a desperate bid to persuade rebels within her own Conservative party to support her deal by promising to resign once it passed the House. Today’s defeat frees her from that pledge, but it is a temporary reprieve. As many as 20 Tory cabinet ministers and backbenchers are said to be sounding out their colleagues and party grandees on potential leadership bids. The list includes former Foreign Secretary Boris Johnson, who pulled out of the race to replace David Cameron in 2016, gifting the poisoned Brexit chalice to May. 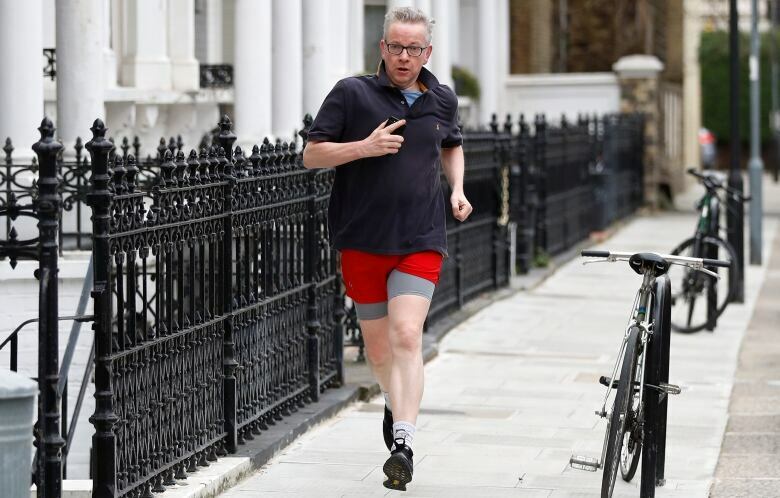 Michael Gove, the environment minister, is also keen — as evidenced by the sudden upsurge in visual-metaphor photos of him jogging awkwardly through the streets of London, holding his phone and wearing his thick-rimmed glasses. Both the current and former Brexit secretaries, Jeremy Hunt and Dominic Raab, are said to be organizing. As is the party’s House leader Andrea Leadsom, former minister Amber Rudd, and a cast of thousands. The British betting shops, Ladbrokes and William Hill, both have Gove as the odds-on favourite to become the country’s next prime minister, followed by Raab, and then Labour leader Jeremy Corbyn. But the opinion polls suggest a distinct lack of enthusiasm among voters. Boris Johnson (or BoJo, as he is known), is the least-loathed leadership option at the moment, with 20 per cent support in a new Sky Data survey. Rudd, Gove and Sajid Javid, the home secretary, tied for second place at eight per cent. The most popular choice among those surveyed was “none of these” at 49 per cent. But while the Conservatives jockey for the keys to 10 Downing Street, the mood in the rest of Europe is increasingly bleak. A no-deal exit on April 12 is now a “likely scenario,” the European Commission said in a statement this afternoon. The British pound is sinking on the currency markets. And Donald Tusk, the European Council president, has called an emergency EU summit for April 10. It seems that even animals will suffer. Reuters today reports that European zoos are worried about the fate of breeding programs for endangered species like elephants and okapis, a rare type of forest giraffe found in the Democratic Republic of Congo. The U.K.’s 50-plus zoos and safari parks are an important source of diversity for the continent’s captive animal populations, and may have trouble sustaining their own herds without European help. 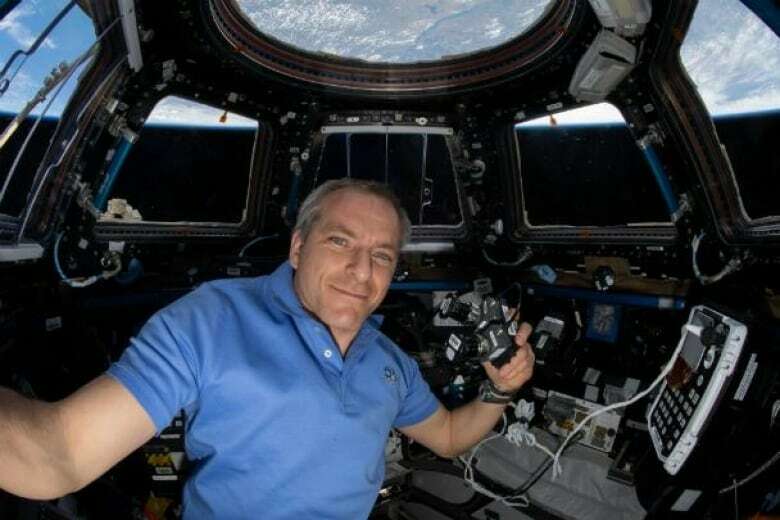 The National co-host Andrew Chang recently placed a really, really long-distance call to Canadian astronaut David Saint-Jacques. It’s not easy arranging a phone call with outer space. CAPCOM: Station, this is Houston. Are you ready for the event? DAVID SAINT-JACQUES: Houston, this is Station. I am ready. CAPCOM: CBC, this is Mission Control, Houston. Please call Station for a voice check. ME: Station, this is Andrew Chang. How do you hear me? Turns out that when you’re speaking to an astronaut whirling around the planet at 7 kilometres per second, there’s no time to waste. But there’s also the unsettling context of Saint-Jacques’ mission. Before his launch into space, a Russian Soyuz capsule crash-landed back to Earth soon after liftoff with two astronauts still inside. Mercifully, they were fine. But it rattled confidence in an otherwise airtight operation, and raised serious questions about Russia’s aging spacecraft technology — the same fleet Saint-Jacques was about to stake his life on. Then there was the pinhole leak in the ISS. Sabotage? No, it turned out to be a carelessly patched-up mistake. It was, however, a jarring reminder of just how fragile life in space can be. And even lighter moments in space have their dark sides. But consider this: when 10 litres of water leaks out onto your bathroom floor, Earthlings might call that “a bad afternoon.” When you’re in zero gravity, encased in one of the most expensive and complex pieces of machinery mankind has ever created, you have a potentially catastrophic situation on your hands. “It’s interesting how the human mind works,” Saint-Jacques tells me, when I suggest his life sounds terrifying. “That notion that you’re one problem away from being very uncomfortable, it kind of changes your mindset. But naturally you want to be at peace … so we kind of change our set point. So it’s not like I live in constant fear, I’m just very aware of my environment. Saint-Jacques’ “acute” spatial awareness is obvious the entire time we speak, short as it is. He flips and spins — his whole body, but also the microphone in his hands — with a grace that belies the fact he’s only been in outer space for a few months. And when we wrap the interview, Saint-Jacques flashes a knowing smile before waving and kicking off with his feet — blasting straight “up” and out of sight. He’s clearly at ease. And certainly knows how to make an exit. People caught on both sides of nightmarish property disputes in B.C. are urging the government to change provincial conservation law, reporter Duncan McCue writes. To me, they look like big hills of dirt with giant cedars growing out of them. But Chief David Jimmie of the Ts’elxwéyeqw Tribe got very emotional when he took me to see them. The mounds are, in fact, ancient gravesites. They’re estimated to be some 1,000 to 1,500 years old. The problem is, Jimmie had to get permission to take me to see the earthen burial mounds, known as “ancestor monuments,” because they’re on private property. 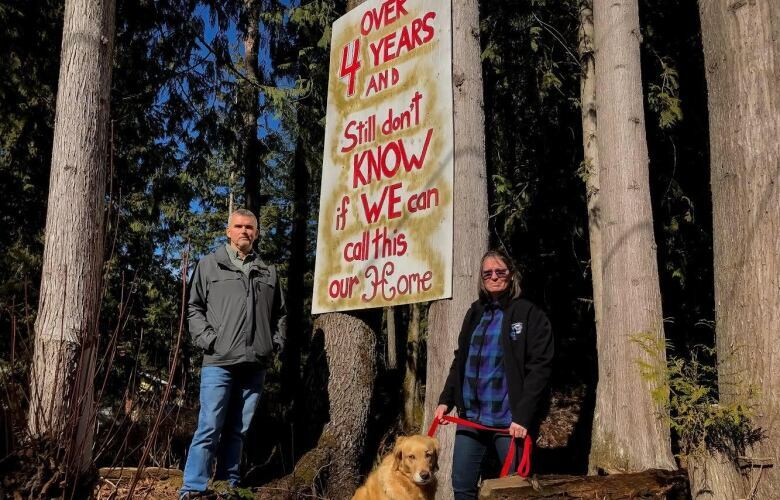 That’s become a nightmare for Beau and Dian Sutton, who bought the wooded half-acre near B.C.’s Chilliwack River in 2014, intending to build their dream home. As soon as they began clearing the land, the mounds were revealed. And the Ts’elxwéyeqw Tribe insisted the ancestor monuments need to be protected. 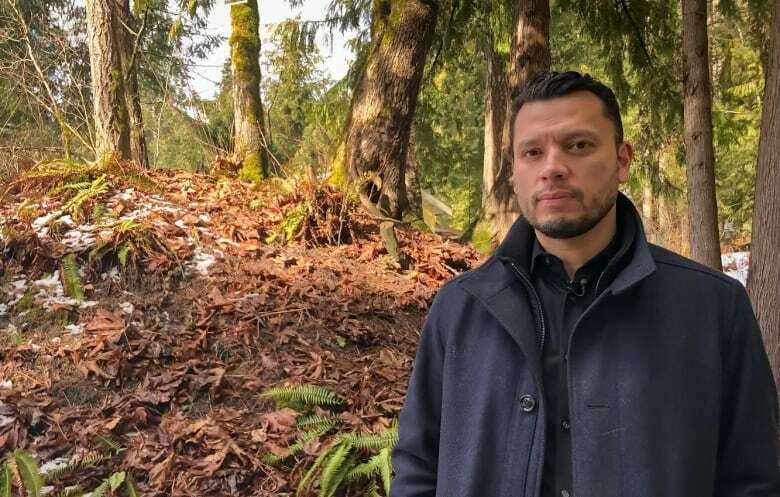 It’s an unfortunately common story in British Columbia, where heritage conservation laws have repeatedly pitted unwitting landowners against First Nations that are trying to stop their burial sites from being bulldozed. Tonight on The National, I’ll take you to the site near the Chilliwack River, and explain how the Suttons and the Ts’elxwéyeqw Tribe are unified in pushing for changes to a law in B.C. that leaves both Indigenous graves and private property owners vulnerable. 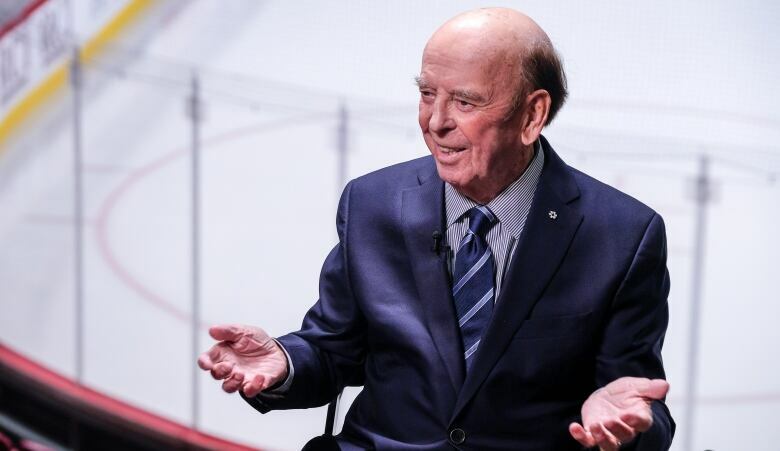 The National co-host Ian Hanomansing gets a startling revelation during an interview with hockey broadcast legend Bob Cole, who is scheduled to call his last Hockey Night in Canada game on April 6. Just sitting down with Bob Cole in Montreal’s Bell Centre was thrilling enough. Being at the home of the Montreal Canadiens with one of the greatest play-by-play announcers in hockey. You won’t be surprised to hear he has so many great hockey memories. His friendships with players, from the Oilers’ dynasty of the ’80s to Sydney Crosby. His connection to the first great Canadian hockey announcer, Foster Hewitt. Calling the game when the rough-and-tumble Philadelphia Flyers cross-checked and slashed a Soviet team off the ice. So for sure, Bob Cole’s story is about hockey — but it’s about broadcasting, too. About the small town kid from Atlantic Canada who fell in love with radio and found a way, with a few lucky breaks, to Hockey Night in Canada. And then there are the magical connections, the ones you sometimes don’t even realize you made. I often talk about sitting in my parents’ kitchen, in 1970, listening to a game on the radio as the Montreal Canadiens valiantly tried to make the playoffs. With a win out of reach, they were tied for the last playoff spot. To break the tie they needed five goals, so they pulled their goalie for much of the third period. To this day, I remember agonizing over their efforts, eyes closed, listening. What I didn’t know until years later, sitting in the Bell Centre, was that the voice on that radio, the voice of hockey that has been with me for almost 50 years, was Bob Cole. – Father Claude Grou, the Montreal priest who was attacked with a knife while saying mass last week, upon his return to work at St. Joseph’s Oratory this morning. Harry Jerome was fast. So fast, that at one point he held the world record in the 60 metre, 100 metre and 100 yard sprints, and shared the 4×100 relay mark.He won a bronze for Canada at the 1964 Tokyo Olympics, and golds at the Pan Am and Commonwealth Games. But his single biggest accomplishment might have been overcoming a gruesome thigh injury and returning to the highest levels of track. Doctors had initially told him that he might never walk again.